Family Leave Insurance Pamphlet in Espanol. WHAT IS FAMILY LEAVE INSURANCE (FLI)? Six weeks of partial wage replacement over a 12-month period to bond with a newborn or newly adopted child or to care for a seriously ill child, parent, spouse, domestic partner or civil union partner. People taking this leave will receive up to 2/3rds of their usual wage, with a maximum of $637/wk* in 2018. Most employees** who work in New Jersey are eligible. You must have worked at least 20 calendar weeks where you earned at least $168/week*, or you earned at least $8,500* in the year before you take family leave. All eligible employees began contributing to the FLI program through their normal paycheck on January 1, 2009. When should you file an application for family leave insurance benefits? An applicaiton, or "claim", must be filed within 30 days after the commencement of a period of family leave. A penalty may be imposed if the claim is filed late. You may give a reason for a late application. Where can you get an application for FLI benefits? Application forms are available on the Department of Labor and Workforce Development’s website, by telephoning the Division of Temporary Disability Insurance’s Customer Service Section at (609) 292-7060, or by writing to the Division of Temporary Disability Insurance, PO Box 387, Trenton, NJ 08625-0387. It is highly recommended to apply online for faster processing times. When can new parents apply for FLI to bond with a newborn or newly adopted child? Family Leave Insurance benefits for bonding with a newborn or newly adopted child are only payable during the 12 months after the child’s birth or adoption. You may apply for FLI anytime within those 12 months. If mothers take FLI immediately after taking temporary disability for pregancy related reasons, they only have to submit the 1-page FL2 form which will be mailed 35 days after delivery, you can also complete the application online here. Does an employee have to notify an employer if he/she intends to claim FLI benefits? Yes. Employees intending to take leave to bond with a newborn or newly adopted child must provide the employer with a minimum of thirty (30) days notice prior to commencement of the family leave. Failure by the employee to provide this notice will result in a 2 week (14 day) reduction in the claimant's maximum FLI benefits entitlement for the 12-month period unless the time of the leave is unforeseeable or the time of the leave changes for unforeseeable reasons. Employees intending to take leave to care for a seriously ill family member on a continuous, non-intermittent basis must provide the employer with prior notice of the family leave in a reasonable and practicable manner, unless an emergency or other unforeseen circumstance precludes prior notice. Employees intending to take leave to care for a seriously ill family member on an intermittent basis must provide the employer with a minimum of fifteen (15) days notice prior to the commencement of the intermittent family leave unless an emergency or other unforeseen circumstance precludes prior notice. Is there a waiting period before FLI benefits can be paid? Yes. The first seven consecutive days of a claim is called the waiting period. If benefits are payable for any period during each of the three consecutive weeks following the waiting period, then benefits are also payable for the waiting period. In the case of intermittent family leave, in a single period of family leave taken to provide care for a family member with a serious health condition, Family Leave Insurance benefits are payable with respect to the first day of leave taken after the waiting period and each subsequent day of leave during that period of family leave. If benefits become payable on any day after the first three weeks in which leave is taken, then benefits will also be payable for any leave taken during the waiting period. Exception: There is no additional seven-day waiting period for a Family Leave Insurance claim for benefits to bond with a newborn when the Family Leave Insurance claim is for the period immediately following a Temporary Disability Insurance (TDI) pregnancy-related claim. Is a FLI claimant required to take FLI benefits all at one time? If the leave is to care for a seriously ill family member, the leave may be taken during one continuous period, up to a maximum of six (6) weeks or intermittently up to a 42 day maximum in a 12-month period. If the leave is to bond with a newborn or newly adopted child, the leave must be taken during one continuous period of time unless both the employee and the employer have agreed to an intermittent leave schedule. In those cases, leave may be taken in non-continuous intermittent periods of seven (7) days or more. All leave taken to bond with a newborn or newly adopted child must be taken during the 12-month period immediately following the birth or adoption of the child. Can an employer require an employee to use paid time off during the period the employee is claiming FLI benefits? Yes. The employer of a claimant may require the claimant, during a period of family leave, to use up to two weeks of paid sick leave, paid vacation time or other leave at full pay. This option does not relieve employers of any collective-bargaining provisions with respect to paid time off. Employees are permitted to take the paid time off during the waiting period. Although the employer may “require” the claimant, during a period of family leave, to use up to two weeks of paid sick leave vacation time or other leave at full pay, the employer may only "permit" the claimant, during a period of family leave, to use more than two weeks of paid sick leave, vacation time or other leave at full pay. No. The Family Leave Insurance program does not protect anyone's job. The program provides partial wage replacement. 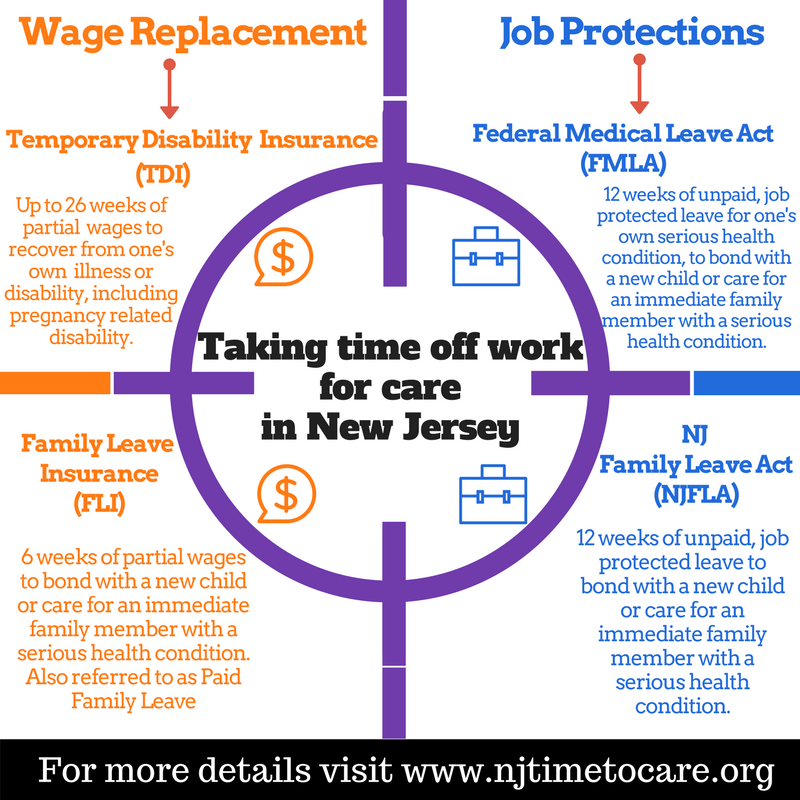 Some employees may have their job protected under other laws, such as the federal Family and Medical Leave Act (FMLA) or the New Jersey Family Leave Act (NJFLA). Can you apply for FLI when unemployed? Yes. If a claimant applies for Family Leave Insurance benefits more than 14 days after his/her last day of work, benefits may be payable under the provisions of the Family Leave Insurance Benefits During Unemployment Program. Individuals claiming benefits under this program must meet all the eligibility requirements of the Unemployment Compensation Law, but are not required to establish availability for work. Can someone get FLI benefits if you have to provide care for a sick family member out of NJ or the country? Yes. A claim may be submitted for Family Leave Insurance benefits to care for a family member with a serious health condition who is out of the state or out of the country. Benefits may be payable provided the medical certificate is properly completed and establishes a need for care. If eligible, benefits are paid for full weekly periods starting from Sunday through Saturday. There is no provision to pay for intermittent days under the Family Leave Insurance Benefits During Unemployment Program. When did it become available? Payroll deductions began in January 2009 and benefits became available July 1, 2009. Workers wanting to bond with a new child can receive FLI benefits during the first 12 months after the child's birth or placement for adoption with the worker’s family. Click Here For Family Leave Insurance Resources, Research and Reports. **Employees of all private and governmental employers subject to the New Jersey Unemployment Compensation Law are covered.